New York.- Nassau County’s acting district attorney Madeline Singas, who is running for the seat on Tuesday’s election against her Republican opponent, Kate Murray (former Town of Hempstead supervisor), has picked up endorsements from all New York major newspapers. The Nassau district attorney’s race is virtually tied, with Democrat Madeline Singas boosting her support among Republicans and Democrats to close a six-point gap that last month favored Republican Kate Murray, according to a Newsday/News 12/Siena College poll. Murray, the Hempstead Town supervisor, still leads Singas, the acting Nassau district attorney, 46 percent to 45 percent. Nine percent said they are undecided leading up to Tuesday’s election. Singas is the daughter of Greek immigrants. She was born in Massachusetts. Her father was born in the village Glina and her mother in Argirochori. When she was 6 years old, her family moved in Astoria, where her father opened a pizza place. She attended the Greek school of St Demetrios and all the family members were actively involved in the Greek community and Church. She is a graduate of Bronx High School of Science, Barnard College at Columbia University, and Fordham University Law School. She was previously a prosecutor in Queens for 15 years before joining the Nassau DA’s office in 2006. Singas has served as Nassau’s assistant chief prosecutor under Rice. «I came from very humble beginnings. My parents could not speak English. And today I am here to show that the American dream exists» she said. Singas lives in Manhasset with her husband and 12-year-old twins. A native of Astoria, Queens, she is a proud first generation Greek-American born to a family committed to community, faith, and education. Greek News publishes the three endorsements for Singas by the New York Times, NY Daily News and NY Newsday. The suburban county of Nassau on New York’s Long Island needs a strong, independent district attorney willing to pursue all manner of crimes, political and otherwise. For that reason, Nassau voters have an important choice in Tuesday’s off-year election, between a seasoned prosecutor who has been Nassau’s acting D.A. for the last 10 months and a legal lightweight deeply embedded in the county’s powerful Republican machine. 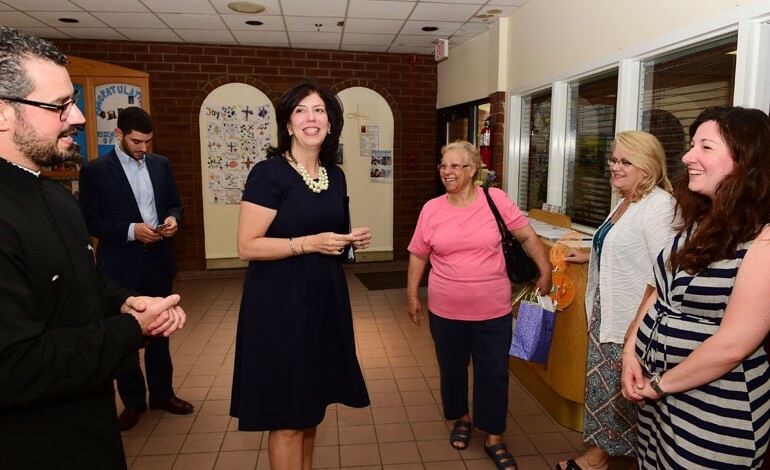 Madeline Singas, the Democrat in this race, has been serving as Nassau’s acting D.A. since the former occupant, Kathleen Rice, resigned in January to become a member of Congress. Ms. Singas, a prosecutor with 24 years of experience in criminal law, has investigated contracting abuses in the county government, and has prosecuted drug dealers and violent criminals. She has also worked on domestic violence and child abuse cases since her days as an assistant district attorney in Queens. But she is also a first-time candidate with little of the political agility or name recognition of her Republican opponent, Kate Murray. Ms. Murray, a lawyer with scant experience in criminal law, has been Hempstead town supervisor since 2003. Until her lack of legal credentials became an issue in this race, Ms. Murray was the clear favorite. She enjoyed the muscular support of a powerful Nassau County Republican machine that includes the former State Senate majority leader, Dean Skelos, now fighting federal corruption charges, and Edward Mangano, the county executive. Sensing that Ms. Murray was not going to be able to secure this patronage-rich position so easily, other big Republican names have agreed to help out, including former Senator Alfonse D’Amato and former Mayor Rudy Giuliani of New York. Such high-level support could make her less inclined to investigate cronyism within her own party. Nassau needs a county prosecutor who is willing to enforce the law, no matter where it leads. In neighboring Suffolk County, Thomas Spota, a Democrat, has made a career of bringing down corrupt officials, even in his own party. Both candidates in this race promise to take on shady dealings in the entrenched, deeply inbred politics of Nassau County, but Ms. Singas has a better opportunity to resist political pressures. Madeline Singas is clearly more qualified for the job of Nassau district attorney. The voters of Nassau County have the opportunity to install a top-flight career prosecutor to lead one of New York’s largest district attorney offices. Madeline Singas fits the bill perfectly, and she gets the Daily News’ enthusiastic endorsement. Singas has a distinguished 24-year record as a lawyer and law enforcement professional. Prosecuting all manner of offenders, she rose through the ranks of the Queens DA’s office before being recruited in 2006 to lead a newly created Special Victims Bureau in Nassau. Her victories included a rare first-degree murder conviction, along with a sentence of life without parole, in the case of a man who had tortured and killed his girlfriend. In 2011, Singas stepped up to serve as chief assistant to then-DA Kathleen Rice, and she took interim command of the 150-lawyer office last January, following Rice’s election to Congress. Her tenure was marked by the federal indictment of former state Senate Majority Leader Dean Skelos, a Nassau Republican, on extortion charges that involved a contract awarded by Nassau County. After studying the county’s contracting system, Singas called it a “recipe for corruption,” forcing County Executive Edward Mangano to make reforms. Singas’ years of service have well prepared her to take full charge. She is widely respected among top New York prosecutors and would mesh seamlessly with federal counterparts who are investigating the Nassau political establishment. A Democrat, Singas has never before run for office. She says she felt compelled to run after Republicans tapped a wholly unqualified candidate in Hempstead Presiding Supervisor Kate Murray. Her judgment about Murray is spot on. Murray has a legal résumé that would barely qualify for a slot as an entry-level assistant DA. Worse, she knows next to nothing about criminal law, court procedure or pressing justice issues, as proven by her preposterous display of ignorance in speaking with the Daily News Editorial Board. Whether the issue was bail, grand jury immunity, prosecution of drunken drivers or investigation of police shootings of unarmed civilians, Murray was clueless about the law. Heck, she seemed not even to have scanned the newspapers. Most revealingly, she admitted she had not read the charges lodged against GOP ally Skelos. This call is not close. Whatever their political affiliation, Nassau voters should unite behind Singas, confident that she would do a good job and prevent the complete political debasement of their district attorney’s office. Ours is the only nation in the world where local prosecutors are elected, a way for citizens to hold them accountable for the enormous power they wield on individual lives and our collective well-being. That wasn’t always the case. District attorneys were once appointed by governors or the state’s top judge. The result was patronage for political supporters and partisan investigations of political opponents. A reform movement swept the nation in the mid-19th century, and the public won the right to elect local prosecutors. So now district attorneys must respond to the electorate even though their institutional role demands they be separate and removed from everyday politics. Acting Nassau County District Attorney Madeline Singas, a Democrat, and Hempstead Town Supervisor Kate Murray, a Republican, are in a fierce race to succeed Kathleen Rice. Few do retail politics better than Murray, always accessible and delivering what her constituents want. Unfortunately, her extensive resume does not include the critical background in criminal law and courtroom procedure that is essential to being a successful prosecutor. Singas doesn’t have Murray’s high name recognition. Instead, she brings 24 years of respected experience in law enforcement. The evidence points to only one verdict: Singas is by far the better choice. Rice hired Singas away from the Queens district attorney in 2006 to head Nassau’s special victims unit, which deals with crimes against children, sexual abuse and domestic violence. Singas, 49, of Manhasset, became top deputy in 2011; and when Rice left for Congress in January, Singas became Nassau’s acting district attorney and has handled the job ably. Singas has shown she’s willing to fight public corruption and stop the pay-to-play culture corroding the public’s faith in government. After a federal indictment charged state Sen. Dean Skelos and his son with improperly influencing the county’s awarding of a $12 million wastewater treatment contract, Singas responded by reviewing Nassau’s entire contracting process. That investigation is continuing. But in July she issued a report that found deep flaws in the county’s system, one that failed to flag potential conflicts of interest, including identifying vendors with criminal convictions and shaky finances. Her findings pressured Nassau County Executive Edward Mangano to appoint a panel led by former Nassau Interim Finance Authority chairman Frank Zarb and accept its recommendation to improve the process. Singas wants to extend her review to Nassau’s towns and cities. Using her office as a tool to make systemic changes is also seen in her comprehensive response to the heroin scourge. Beyond the criminal prosecution of dealers and traffickers, she wants to reduce demand. Singas is funding a desperately needed program to provide round-the-clock treatment of heroin addicts. The program will allow Maryhaven’s Hope Crisis Center in Freeport to have 35 beds for those who overdose, are revived with Narcan in emergency rooms but then have no place to go to kick their habit. Maryhaven vans will go to emergency rooms evenings and weekends to take recovering addicts directly to the facility. In crafting her plan, Singas worked with addiction counselors and families. The $585,000 program is the first in the state paid for with forfeiture funds, the assets seized as criminal proceeds. Murray, 53, of Levittown, who has led Hempstead for 12 years, sees the job of district attorney as one of setting a vision and then managing the office of 187 attorneys to achieve it. This managerial approach worked in her current job and prior positions as a state legislator and town clerk. But being a prosecutor demands singular skills and specialized knowledge that take a long time to develop. Her few years as an assistant attorney general defending the state against lawsuits by state prison inmates isn’t enough. Leading an organization while trying to develop a deep and granular understanding of what it does would present a steep uphill climb. The district attorney is solely responsible for decisions on civil liberties — such as signing affidavits, authorizing search warrants and wiretaps, dismissing cases when there is no evidence to support charges, or indicting someone despite his or her prominence or political connections. Murray deflects concern that she would be the first district attorney in recent history on Long Island not to come from the ranks of active attorneys working in criminal justice or from the judiciary. Pointing to her job as supervisor, Murray says she has surrounded herself with smart staffers to run the town. Managing the budget, she says, is one of her top skills, and her campaign literature includes the phrase “tax cutter.” That’s not only inaccurate, it’s a fundamental misunderstanding of the unique nature of the post she is seeking. If Murray wants to move on to a countywide office, she seems better suited as a candidate for county executive. In detailing her priorities as district attorney, Murray lists battling the heroin epidemic, domestic violence and political corruption. Murray says she will advocate for tougher sentences for drug dealers, although it is the presiding judge in a particular case who makes that decision. Targeting the heroin scourge on the streets is a complex effort that involves working with federal agents in the FBI, Drug Enforcement Administration and Bureau of Alcohol, Tobacco, Firearms and Explosives to take down trafficking rings. It will take Murray a long time to establish the deep trust and professional respect needed to work on sensitive investigations in which strategies and confidential informants are shared. Murray understands well the toll the heroin problem has taken on the county’s young adults. Her answer is to expand Singas program. That’s quite an endorsement of her challenger. Singas said she will commit more funds but she wants the pilot program tested before expanding it. As for her third priority, public corruption, Murray asserts she has done more than Singas on this front. Her sole example is that she turned over a complaint in 2012 that then-Hempstead Town Clerk Mark Bonilla had made unwanted advances on a young female staffer. Murray said she called Rice directly. She did, but then Rice turned to Singas to oversee the case. Singas uncovered much more damning evidence against Bonilla, and he was convicted of official misconduct. Sexual harassment by an elected official is an uncommon definition of public corruption. And Murray only reported an incident that was reverberating off the walls at town hall. When asked whether she would prosecute county legislators for the misuse of taxpayer dollars on official mailers before Election Day, Murray said there were “issues far more important that should be focused on.” Singas wants the law changed so that she can. Public officials who can’t or won’t do what is expected of them are exactly what’s frustrating Americans from Main Street to Washington. Choose a district attorney who can and wants to do the job.